I won’t mess with you: he’s alive. They’re just kids playing at the beach. “Hey, cover me with sand, OK?” “Sure, you wanna be a mummy or a zombie?” And it was a beautiful day, with lots of kids and some adults all having a fine time. And nothing terrible happened to wreck the day. In much of the world, that wouldn’t be news, but this was in Somalia. It’s a remarkable photo, of course, even if you don’t know the locale. Zombie, mummy, initiation rite, mud pack, body cast, bombing casualty, burn victim, corpse, death mask, burial rite, . . . . The photographer has captured something like spontaneous performance art in everyday life: a moment of theatrical technique in the time out of time of a vacation day, and to register some deep sense of the uncanny. The boy is both alive and dead, whole and maimed, playing in the everyday world and exhibiting the ghastly iconography of a war zone. It seems that even his pal is starting to sense that something strange is happening. And something strange is happening: an interlude of play is being overtaken by the possibility of a horrific future. Somalia is one of the more dangerous places in the world right now. This photograph provided the visual coda for a story on Mohamed Abdiwahab, a freelance photographer who has been taking hundreds of images of the carnage for the past several years. It’s a small miracle that he’s still alive, and living means that he has to deal with both the trauma of conflict photography and the near total indifference of most of the world to whether Somalians live or die. Which is another reason that the photograph above is remarkable, for it documents what is most likely to be forgotten and most surprising when brought back to our attention. Thus, it is a both reminder and a statement of hope. 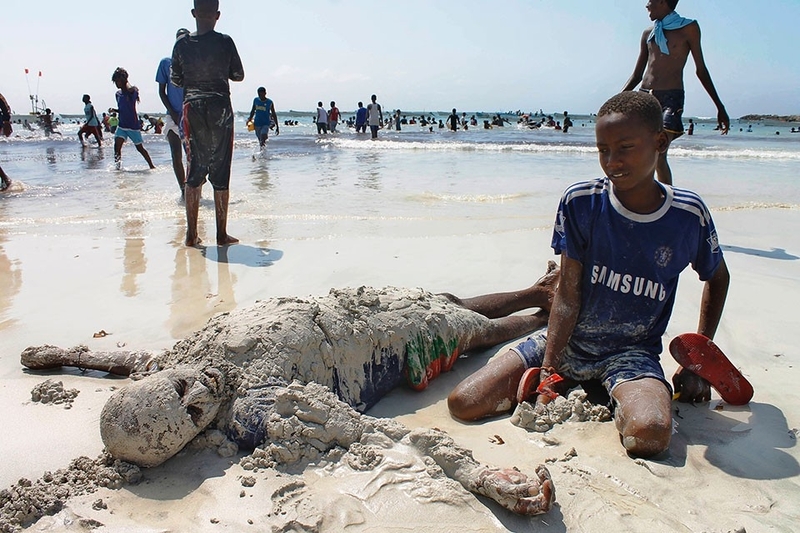 We are reminded that Somalia is not just a war zone, and that the people there, like people everywhere, continue to do what they can to enjoy life, not least the simple pleasures of a day at the beach. The point here is not to celebrate the human spirit, but rather to understand that people don’t have to be asking for the moon when they ask for peace and stability. A normal life will do, thank you very much, and is that really beyond the reach of those who rule them, sell them their Samsung t-shirts, or are otherwise invested in Somalia? The hope is, as it often is, invested in the children. They can play, God bless ’em, even as Death stalks them. More to the point, the photographer is giving them their day in the sun. They are not to be seen or remembered only if they are victims, but rather for what they are: kids who, like all kids, deserve a shot at having a future worth having. As the view stretches beyond them to shimmering beach and blue sky, one can at least imagine that the solution to pulling Somalia back from anarchy need not be impossible. But then we get back to that mock corpse. Mocking, insistent, it says the scene holds not one future but two: a future where kids grow up to have kids that play at the beach, and one where younger kids watch their older playmates turn into casualties. We owe it to the kids, and the photographer, to hope for the first, and to recognize which one is more likely if hope is all they have. Photograph by Mohamed Abdiwahab/AFP-Getty Images.